G’day! I am Charlie Daniels. Though in more informal times I am known as just Charlie! 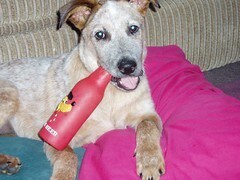 I am an Australian Cattle Dog – though you may know me as a Red Heeler. My birthday is September 14, 2007. This is the story of my life. I live in Newcastle, Australia with My Bi-Peds – The Big Unit (TBU), Her Highness (HH), Chook, Pumpkin and Moo. I was lucky enough to make this my Forever Home on January 18, 2008. I love it here.